This is a mid century modern gateleg table with 2 folding extension leaves and 4 folding chairs. The table has a tambour door that rolls up to store the chairs. The folding leaves extend and are supported by the gatelegs that swing open under the table. Perfect for small spaces, and extra serving space. It is easy to store, and rolls on wheels for easy transport. There is a small utility drawer on the back. Table dimensions: 62″W (both leaves unfolded up), 12.5″W leaves folded down, 34″D, 29″H. Chair dimensions: 14.5″ seat width, 14.5″ seat depth, 17″ seat height, 28.5″ back height. Accessories sold separately. 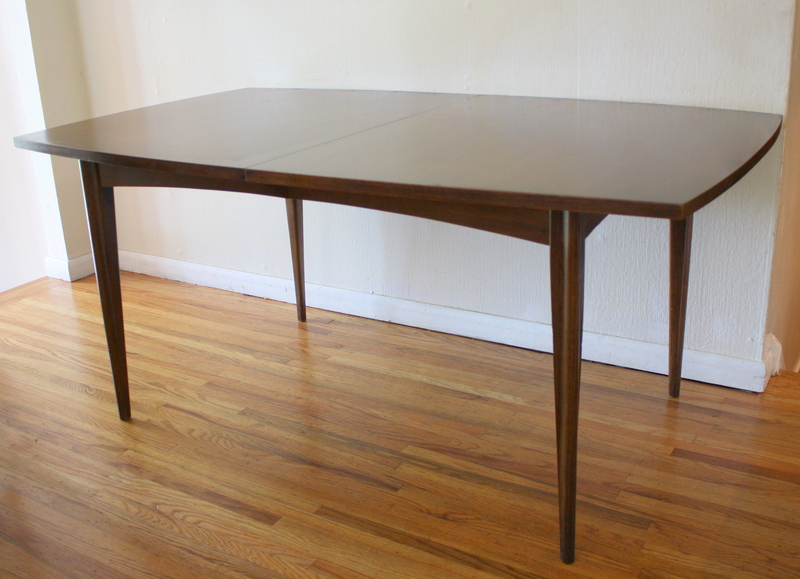 This is a mid century modern dining table by Paul McCobb. It has 2 folding leaves, and one 12″W removable extension leaf. It has beautiful aluminium accents in the base. Dimensions: Folding leaves extended: 54”W x 40”D x 29.5”H, Folding leaves down: 24”W. 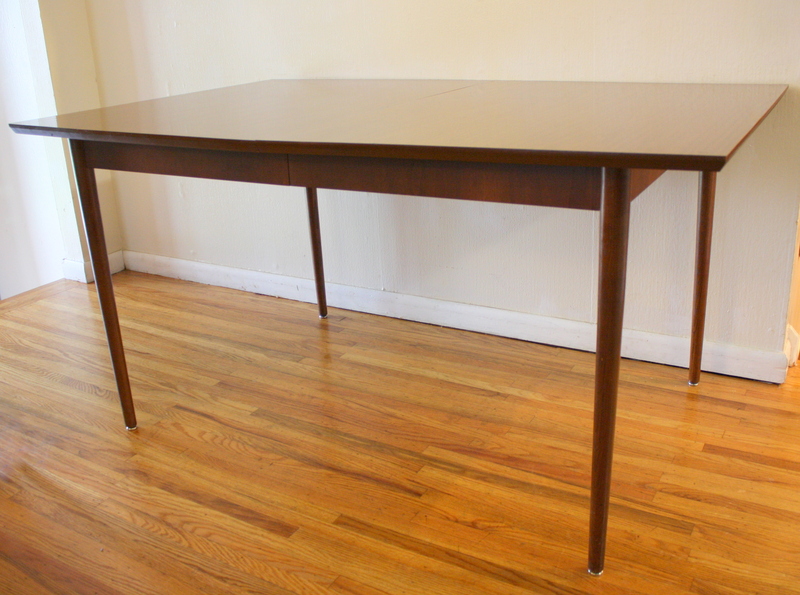 This is a mid century modern dining table. It has a surfboard design with tapered edges and legs: 60″W x 39.5″D x 29.5″H. It has 3 extension leaves that add 12″W each. Pictured with dining chairs separately listed. This dining table is sold. This is a mid century modern gateleg table with 2 folding leaves and all 4 original folding chairs. The table has a tambour door that rolls up to store the chairs. The folding leaves extend and are supported by the gatelegs that swing open under the table. Perfect for small spaces, and extra serving space. It is easy to store, rolls on wheels for easy transport. Table dimensions: 62″W (both leaves unfolded up), 13″W leaves folded down, 34″D, 29″H. Chair dimensions: 14.5″ seat width, 14.5″ seat depth, 17″ seat height, 28.5″ back height. Accessories sold separately. This is a mid century modern square dining table from the Broyhill Brasilia collection with surfboard tapered edges and sculpted tapered legs. It expands with an 18″ extension leaf. Dimensions: 42″W without leaf, 60″ with leaf, 42″D , 29″H. This is a mid century modern Saarinen style tulip base dining table featured with a pair of Burke shell chairs with cross bases and vibrant orange nauhgahyde upholstered cushions. Dimensions of dining table: 36″ diameter, 30″H. Burke chairs: seat width: 19”, seat depth: 17.5”, seat height: 19.5”, back height: 31”. Accessories sold separately. The table and chairs are sold. This is a mid century modern dining table that has a surfboard tapered design, and tapered brass tipped legs with an atomic design. It has one 12″ extension leaf. Dimensions: 60″W (not including the leaf) x 40″D x 30″H. These are 2 mid century modern dining tables. The first dining table has a surfboard design, tapered legs, and 1 extension leaf that adds 12″W. Dimensions: 62″W x 40″D x 30″H. The second dining table has beautiful tapered legs and 2 extension leaves. Dimensions: 60″W x 40″D x 30.5″H. Each leaf adds 15″W. Both dining tables are sold. This is a mid century modern surfboard dining table by Broyhill, and is compatible with Brasilia and Saga collections with their signature sculpted tapered legs. Dimensions: 65.5″W x 40″D x 30″H. It has 2 extension leaves that add 12″W per leaf. 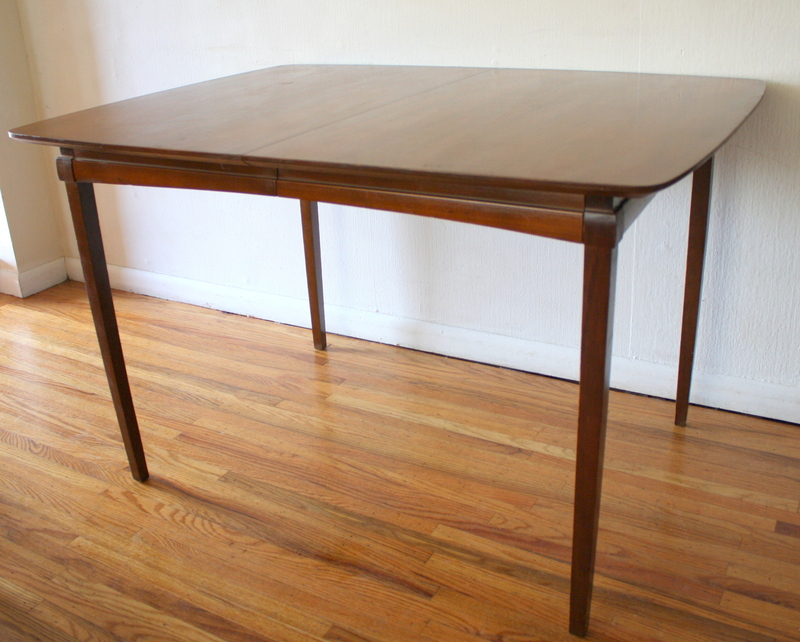 This is a mid century modern gateleg dining table with an art deco feel and a streamlined design. Each leaf can be folded down or extended as needed. Dimensions: 54″W both leaves expanded, 9″W both leaves folded down, 36″D, 29″H. This is a mid century modern dining table from the Broyhill Brasilia collection with a set of 6 dining chairs. The table has their signature sculpted legs, surfboard design, and 1 extension leaf that adds 12″ in width. Dimensions: 66.5″W x 40″D x 30″H.m It also has 2 extension leaves that add 12″W per leaf. The chairs have solid wood frames with sculpted tall backs that display their signature arches, and newly covered seats in teal tweed. Dimensions: seat width: 20″, seat depth: 17″, seat height: 18″, back height: 37″. These are 2 mid century modern Saarinen style tulip base tables. The first is a dining table: 36″ diameter, 30″H. The second is a side end table: 24″ diameter, 22.5″H. Accessories sold separately. These are 2 mid century modern surfboard dining tables. The first dining table has tapered legs and 2 extension leaves that add an additional 18″W per leaf: 66″W x 42″D x 30″H. The second dining table has an arched floating base and tapered legs: 48″W x 34″D x 29″H. It has 1 extension leaf that adds 12″W. This is a mid century modern refractory dining table. It has a surfboard design, tapered legs, and 2 extension leaves that store under the table. Dimensions: with leaves stored:51.5″W x 36″D x 30″H. With leaves extended: 87.5″W. Each leaf adds 18″ of width. 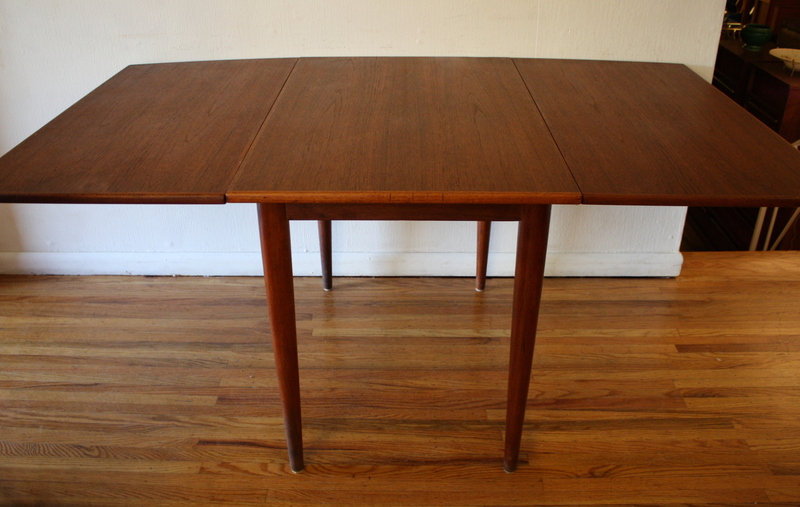 These are 2 mid century modern teak dining tables with a gateleg design. Each leaf can be folded down or extended as needed. The first is a Norwegian teak dining table with a beautiful arched base. Marked made in Norway. Dimensions: leaves folded down: 13.5″W x 35″D x 29″H, both leaves extended: 64″W x 35″D x 29″H. The second is a Danish teak dining table and has a beautiful (wider) arched base. Dimensions: leaves folded down: 13.5″W x 35″D x 29″H, both leaves extended: 64″W x 35″D x 29″H. Both gateleg tables are sold. This is a mid century modern dining table from the Broyhill Brasilia collection with a set of 6 dining chairs: 4 side chairs and 2 arm captain chairs. The table has their signature sculpted legs, surfboard design, and 1 extension leaf that adds 12″ in width. Dimensions: 58″W (70″W with leaf) x 40″D x 29″H. The chairs have solid wood frames with sculpted tall backs and newly covered seats in teal tweed. Dimensions: seat width: 19.5″, seat depth: 15.5″, seat height: 19″, back height: 42″. This is a mid century modern dining set with 4 chairs and 1 dining table. Both the table and chairs have brass accented tapered legs. The 4 chairs have solid wood frames with beautiful curved backs. The seats have been reupholstered with new teal tweed. Dimensions of chairs: seat width: 22″, seat depth: 19″, seat height: 17″, back height: 30″. The dining table has an extension leaf that adds 12″ of width: 48″W x 36″D x 29″H. 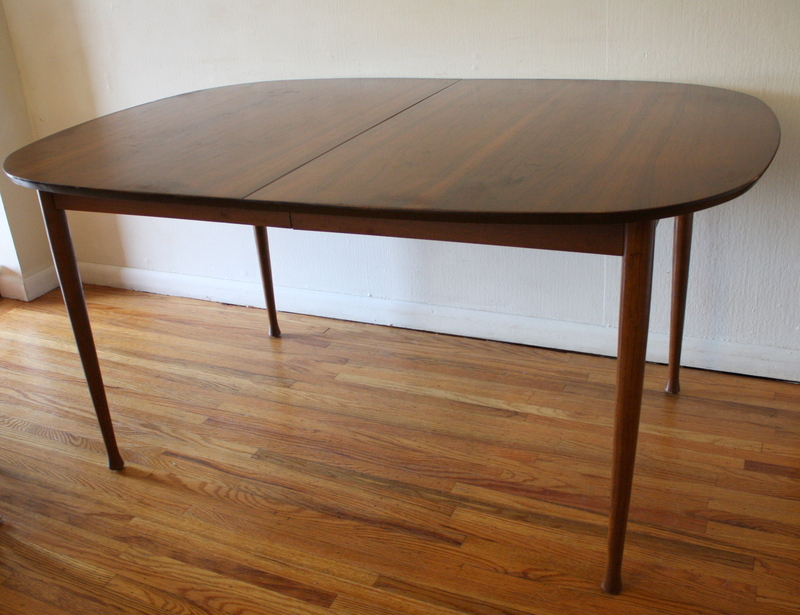 This is a mid century modern dining table with a beautiful arched base. It has a gateleg design and each leaf can be folded down or extended as needed. Dimensions: leaves folded down: 13.5″W x 35″D x 29″H, both leaves extended: 64″W x 35″D x 29″H. This is a mid century modern dining set by designer Russel Wright for Conant Ball. The round dining table 48″ in diameter and 30.5″H, extends to 72″ with 2 leaves, 12″ each. The table has a beautiful splayed leg design. There are 4 dining chairs in this set in a complimentary Windsor style. Dimensions: seat width:18.5ʺW, seat depth: 16.5ʺD, seat height: 17″H, back height: 31.0ʺH. 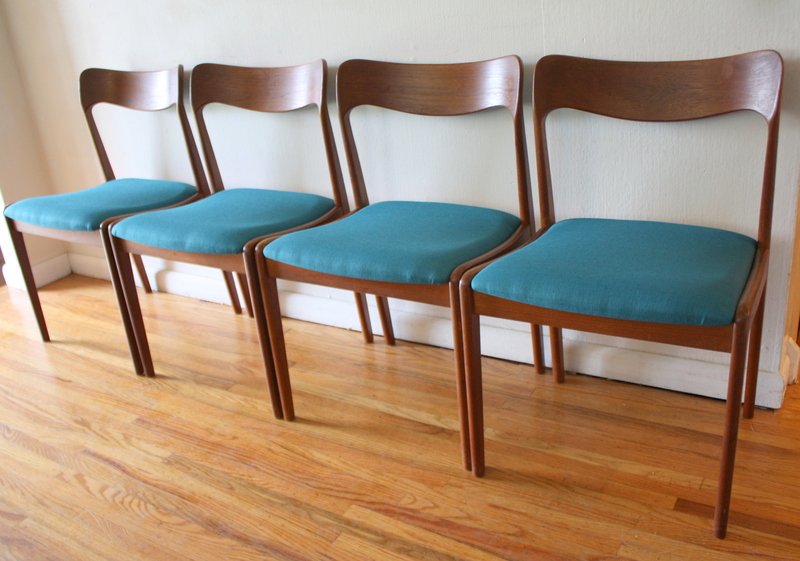 This is a mid century modern Danish teak dining chair set and folding dining table. The chairs solid teak frame has a sculpted curved back. The upholstered seats have been recovered in a teal tweed. Dimensions: 18″ seat width, 17″ seat depth, 18″ seat height, 30″ back height. The teak table has a simple clean design with tapered legs and 2 folding extension leaves. Dimensions: 23.5″W (leaves down), 2 folding leaves: each leaf 19.5″W, 37″D, 28.5″H. Both the table and chairs are sold. These are 2 mid century modern dining tables with built in hidden leaves. The table slides open to reveal an extension leaf 12″W, that unfolds and slides into grooves. The first table has a surfboard design with tapered edges: 48″W (without leaf) x 36″D x 30″H. The second table has a surfboard design with rounded edges: 59.5″W (without leaf) x 40″D x 29.5″H. 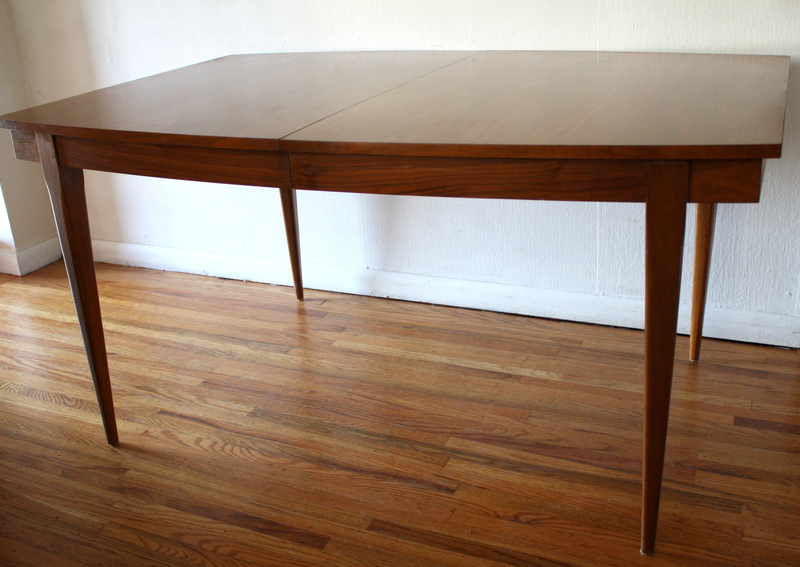 This is a mid century modern dining table with a surfboard design and tapered legs. It has a beautiful wood grain and 2 extension leaves that measure 18″ each. Dimensions of table without the leaves: 58″W x 40″D x 29.5″H. It is shown with 2 of our dining chair sets listed separately. These are 2 mid century modern dining tables with a surfboard design, sculpted tapered legs and base, and a beautiful wood grain. The first one is solid wood, has 2 extension leaves. Each leaf adds an additional 18 inches. Dimensions: 65″W (without the leaves) x 39″D x 30″H. The second dining table is solid wood, with 1 extension leaf which adds 12″, a formica wood grain top, and tapered legs. Dimensions: 60″W (without the leaf) x 40″D x 30″H. **The difference in the tables can be seen in the leg shape and base. The top has the same curvature style.